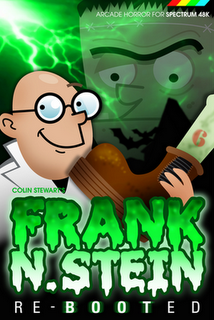 The reboot of the classic game from 1984 Frank N Stein is here! The game's author Colin Stewart was kind enough to give me a sneak preview copy (see preview note here and an interview with Colin here) so here we are with a look at the game itself, twenty seven years after the original was released by PSS Software. This is a classic game in the platform genre, and even back in 1984 it was a little different from the likes of Manic Miner, Fahreneit 3000 and Jet Set Willy. The title was different from other arcade game platformers of the era due to the gameplay mechanics and the objective. ﻿Instead of the usual left, right and jump controls, in this game you had left, right and 'use' (and 'jump' is available on certain screens). It was up to you how best to use the various items around the screen to navigate your way around. The object of the game (playing as Prof. Stein) is to fulfill a life-long ambition and build your own monster. To do this you need to collect all the necessary body parts! A skull, arms, legs, a rib-cage.... you get the idea. Guiding our little egg-head professor around the dungeon picking up the bones to assemble the monster like an air-fix kit is great fun, not to mention challenging. You have to collect the parts in the correct order and each one collected appears in the electrode 'cage' at the top of the screen as the monster is built up. At this point it is advisable to run around the room proclaiming yourself to be a new god and life giver as maniacally as possible. Once you have calmed yourself down it is onto the next screen. The format changes on the second screen - as your own home made monster turns against you as he starts rolling barrells down the screen towards you (the cheeky bugger). But here is the neat twist; now you can jump whenever you want as well as use on screen items. You have to make your way to the top of the screen and throw the switch whilst avoiding the nasties and pitfalls along the way. Throw the switch and you've beaten your monster and it is on to the next screen. ﻿ The other neat aspects of this game are the objects dotted around the screen. There are springs to launch you upwards, fireman poles to slide down, light bulbs to electrocute you (you do not lose a life but are hampered for a couple of seconds), slime to slow you down, ice to make you slip (and prevent you from jumping) and any manner of weird critters to avoid at all costs. It is the use of springs and poles to get around the screen along with timing your jumps and slides (to avoid the creatuers) that make the game stand out. Careful planning is required to collect the parts and create the monster before the time clock ebbs away. With now over fifty screens to play through this is a computer game that will keep me going for the next few weeks. I have only seen a few screens so far (I'm not as good as I used to be!) but the level layout is very well done and the alternating game styles mixes the action up nicely. The sprites are nicely animated and move around the screen smoothly. All I can say is that this is a great re-boot of a classic game and I for one am looking forward to Colin's next game, Dracula. Level 3 - Note how much I am struggling! If you like classic arcade action then give this game a go, you will not be disappointed. It will be available to play on the 14th of September, precisely twenty seven years since it's first incarnation.